Hello and welcome to Apparently Parent's Resources. This page is dedicated to resources that I believe are essential and beneficial for parents who want to understand their children better and improve their parenting skills; and also for mental health and counselling professionals who work with parents and children. In addition to those, I have curated the resources that I think are useful for creating and running an online business such as this. Some of the following links are affiliate links, meaning that if you make a purchase via one of those link, I may get a commission at no added cost to you. It's very important for me to say that every one of the resources that appear here were tried by me and I recommend them based on my own experience with these products and because I truly believe in their merit. I will never recommend a product that I don't believe in. If you have any question or would like to learn more about any of those recommendations, please send me a message. Click on the button that is most relevant for you. The following are resources that I believe can help you work on your parenting. You can truly say that these resources are a natural continuation for most of the things I write about in this blog. If you want to learn more about any of these, don't be a stranger, write to me. Dr. Dan Siegel is one of my favorite writers in psychology at large and in parenting in particular. He's a very fertile author and a big influence of mine. No Drama Discipline – co-authored with Dr. Tina Payne Bryson –is the no.1 MUST HAVE book for every parent who wants a healthy relationship with his kids. To be frank, much of what I teach my clients and in this blog is influenced by this book and other works of Siegel. If you buy only one parenting book this year -this is it. 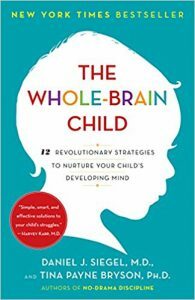 The Whole Brain Child is really the best companion for No Drama Discipline. Written by the same authors, this book lays the ground for the understanding how the way the brains of our children work. That knowledge, and the great tips that are given in the book, will help you understand your child better, especially in stressful times, and will definitely help you manage their big emotions. As you may have noticed, I'm somewhat of a follower of the Attachment Theory. 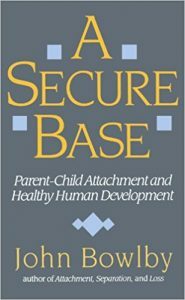 A Secure Base is a wonderful book written by John Bowlby who was the progenitor of Attachment Theory. 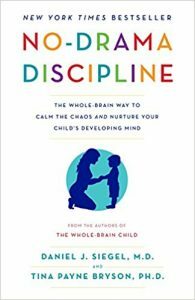 What I love about this book is that it's not aimed solely to psychologists and counselors, and everybody who cares about child development and parent-child relationships – such as you, no? – can find a wealth of knowledge in here. I really love Acceptance and Commitment Therapy (ACT for short). It's a therapeutic philosophy and technique that is both evidence-based and really easy to understand. I use it a lot in my practice and as you may have noticed, it guides a lot of my ideas here in Apparently Parent. 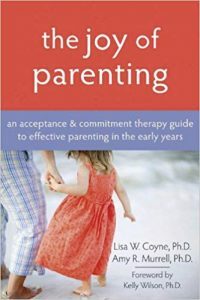 The Joy of Parenting is a wonderful book for parents who want to know more about ACT and how they can use these ideas in their own parenting. It's a well written book and a very practical one, which I recommend a lot to my patients. All of the above resources, for parents, are really useful for mental healther practioiners who work with parents and families. However, I decided to include some of my favorite resources that were written specifically for that population. The following resources truly changed my life as a professional. If you want to learn more about any of these, don't be a stranger, write to me. This is an important book for anyone who works with families. Be it family therapy, parental counselling, whatever you want to call it – if you don't know Daniel Hughes and his approach, you're missing out big time. Attachment Focused Family Therapy (not to be confused with Attachment Based Family Therapy which is a great model, but it's something else) is a wonderful book, explaining why and how attachment can be used to understand relationships in the family and how you as the therapist can facilitate this knowledge in order to enhance your work. I cannot stress this enough – if you buy one book about therapy work with parents and children, this should be the one. 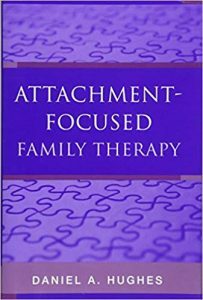 In addition to this book, Hughes published also the Attachment-Focused Family Therapy Workbook. You can use this book to practice the theoretical aspects your read about in the book itself. It's practical and really helps to assimilate the PACE method outlined in the book. Click Here for the workbook. I already mentioned how much I love ACT in my therapeutic work (and admittedly, in my life). ACT is really versatile and can be used with many different populations, and this book is about ACT work with adolescents. 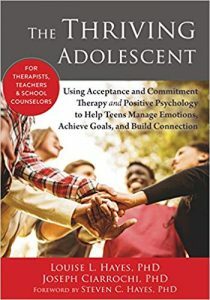 The Thriving Adolescent is a really creative, and quite flexible, therapy protocol, that will help you implement ACT principles in your work with adolescents. And I must say that I use some of these ideas with parents as well. Great book. This one is not a book about parenting or about working with families. However, it is – in my humble opinion – a must have for any mental health practitioner. This is the basic book of AEDP, which stands for Accelerated Experiential Dynamic Psychotherapy. This is an Attachment-based psychotherapy model that was founded by Diana Fosha, PhD. 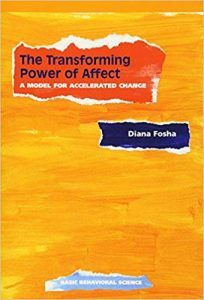 In this book, Fosha lays down the model, offers a lot of information from neurological and emotion studies and gives many clinical examples that are just fascinating. Although this is not about parenting, it IS about a model of work with adults and parents that I think is absolutely amazing and heart-and-eye opening. What does resources for online businesses have to do with parenting, you ask? Well, nothing much immediately. However, after creating several blogs in the past decades, I wanted to share the resources that I find most helpful for the budding blogger/entrepreneur. Those resources really helped me with creating this site and I'm sure they could help you too. If you're interested in creating an online business, you have to get to know Pat Flynn and his awesome site – Smart Passive Income. Pat is a blogger, podcaster, speaker and all-round super helpful guy. He inspired me deeply at the time I was working on creating Apparently Parent with his great ideas and also his open and trust-worthy attitude. He's also a real family man who openly talks about the importance of fatherhood to him, which I love. Will it Fly? 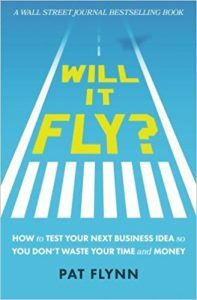 is a book Pat wrote in 2016 that's basically a guide that will help you figure out what business (online or offline) you want to create and if you can make it work. It's an easy read and really, really helpful. If you're thinking about opening an online business, start with reading this. In the blogging (and online businesses) scene, WordPress is a popular platform to build your site on. I've been using WordPress for more than a decade and I love the versatility it provides. When you use WordPress as your platform, you have to use a theme, which is basically the “skin” of your site. After years of working with different themes, I have settled on GeneratePress as my go to theme. This site runs on GP and I use it on other sites as well. Why I think this is such a great theme? First of all, it's lightweight – it was written with loading speeds on mind. But on the other hand, it's versatile and have many useful customization functions that will make your site beautiful. The support is great, Tom – the man behind the wheels – is really available on the support forums. GeneratePress is a free theme but I recommend the premium version that will unlock great features that will take your site's design to the next level. For just 49.95$ as a one-time payment you'll get a license for as many websites as you wish.